The Fontainebleu Hotel is Miami Beach is freaking awesome. Easiest way to put it. The rooms were nice, the lobby was spectacular, the staff was marvelous, and the pool was breathtaking. It would seem like the hotel had everything perfect, including Gotham Steakhouse which was fantastic as well. But when it comes to the food at Vida in the hotel, it is far from perfect. Although now would be a perfect time to complain about the $80+ breakfast the three of us had one morning at Vida, we will focus instead on what I like to focus on best....The Pizza. The Pizza I ordered from the menu was called the Margarita. It specifically states that for $17.00 it comes with mozzarella cheese & sweet basil. As you can see in the above photo, they certainly failed to mention that it comes with tomatoes on top of the pizza. I mentioned to the waitress that I didn't want tomatoes on my pie, and she reluctantly took it to the kitchen to explain that I wanted it plain. For such a relatively remarkable resort, I expected the kitchen staff to handle my request a little more eloquently then the chef did. He started screaming at the waitress about "that's how our pies are made" and some other stuff that I cannot recall. Hey Chef (or whatever you are since your food certainly didn't taste like it was from a chef)..... here is a good tip..... if that is how you make your so called pizzas, then indicate it on your menu. What kills me about this place is that the crust was actually amazing. The sauce and the cheese mixture was awful though. I feel like finding out how they make their dough so I could bring it to a place that actually has decent sauce and cheese and missing good crust. The crust was perfectly cooked, and had a distinct charred taste. It reminded me of the crust that I used to have at Arturo's on Houston Street in Manhattan. Vida, you have nice ovens, you obviously have a good dough recipe. Learn how to make sauce and use a more quality cheese, and you most likely will receive a MUCH higher ranking from me. 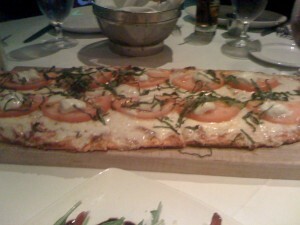 For now, Vida Restaurant in the Fontainebleu Resort gets 2 out of 8 slices.